This week Massachusetts-based Osram Sylvania announced a 100-watt replacement LED light bulb that uses only 20 watts of energy. In fact, the company claims it’s the first to market with such a replacement offering. 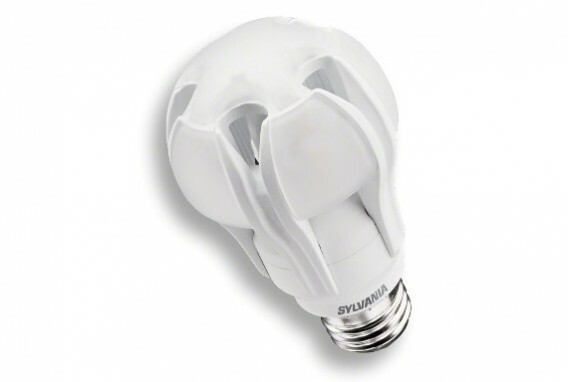 Sylvania Ultra LED is an A21 bulb (larger than the A19 shape) with a rated life of up to 25,000 hours, a color temperature of 2700 Kelvin, and a CRI of 80. The LED bulb outputs 1600 lumens, according to LEDs Magazine, and is expected to sell for about $50 at Lowe’s. Announcements from LightFair this week lit up the news world. Lighting Science Group introduced cheap 40-watt and 60-watt replacement Definity LEDs, while Philips unveiled a brighter, more expensive 60-watt replacement EnduraLED. Not content with sitting the sidelines, Osram Sylvania today announced a bright 60-watt replacement LED that outputs 810 lumens.